The Republics of the Union of Soviet Socialist Republics or Union Republics (Russian: Сою́зные Респу́блики, tr. Soyúznye Respúbliki) were the ethnically based proto-states of the Soviet Union. For most of its history, the USSR was a highly centralized state; the decentralization reforms during the era of Perestroika ("Restructuring") and Glasnost ("Openness") conducted by Mikhail Gorbachev are cited as one of the factors which led to the dissolution of the USSR in 1991. "Soviet socialist republic" redirects here. For the type of government, see Soviet republic (system of government). This article is about the constituent republics of the Soviet Union. For other uses, see Soviet Republic. According to Article 76 of the 1977 Soviet Constitution, a Union Republic was a sovereign Soviet socialist state that had united with other Soviet Republics in the USSR. Article 81 of the Constitution stated that "the sovereign rights of Union Republics shall be safeguarded by the USSR". In the final decades of its existence, the Soviet Union officially consisted of fifteen Soviet Socialist Republics (SSRs). All of them, with the exception of the Russian Federation (until 1990), had their own local party chapters of the All-Union Communist Party. Outside the territory of the Russian Federation, the republics were constituted mostly in lands that had formerly belonged to the Russian Empire and had been acquired by it between the 1700 Great Northern War and the Anglo-Russian Convention of 1907. In 1944, amendments to the All-Union Constitution allowed for separate branches of the Red Army for each Soviet Republic. They also allowed for Republic-level commissariats for foreign affairs and defense, allowing them to be recognized as de jure independent states in international law. This allowed for two Soviet Republics, Ukraine and Byelorussia, (as well as the USSR as a whole) to join the United Nations General Assembly as founding members in 1945. All of the former Republics of the Union are now independent countries, with ten of them (all except the Baltic states, Georgia and Ukraine) being very loosely organized under the heading of the Commonwealth of Independent States. However, most of the international community did not consider the Baltic countries (Lithuania, Latvia, and Estonia) to have legitimately been part of the USSR. The Baltic states assert that their incorporation into the Soviet Union in 1940 (as the Lithuanian, Latvian, and Estonian SSRs) under the provisions of the 1939 Molotov–Ribbentrop Pact was illegal, and that they therefore remained independent countries under Soviet occupation. Their position is supported by the European Union, the European Court of Human Rights, the United Nations Human Rights Council and the United States. In contrast, the Russian government and state officials maintain that the Soviet annexation of the Baltic states was legitimate.. Constitutionally, the Soviet Union was a federation. In accordance with provisions present in the Constitution (versions adopted in 1924, 1936 and 1977), each republic retained the right to secede from the USSR. Throughout the Cold War, this right was widely considered to be meaningless; however, the corresponding Article 72 of the 1977 Constitution was used in December 1991 to effectively dissolve the Soviet Union, when Russia, Ukraine, and Belarus seceded from the Union. In practice, the USSR was a highly centralised entity from its creation in 1922 until the mid-1980s when political forces unleashed by reforms undertaken by Mikhail Gorbachev resulted in the loosening of central control and its ultimate dissolution. Under the constitution adopted in 1936 and modified along the way until October 1977, the political foundation of the Soviet Union was formed by the Soviets (Councils) of People's Deputies. These existed at all levels of the administrative hierarchy, with the Soviet Union as a whole under the nominal control of the Supreme Soviet of the USSR, located in Moscow within the Russian Federation. Along with the state administrative hierarchy, there existed a parallel structure of party organizations, which allowed the Politburo to exercise large amounts of control over the republics. State administrative organs took direction from the parallel party organs, and appointments of all party and state officials required approval of the central organs of the party. Each republic had its own unique set of state symbols: a flag, a coat of arms, and, with the exception of Russia until 1990, an anthem. Every republic of the Soviet Union also was awarded with the Order of Lenin. Poster of the unity of the Soviet republics in the late 1930s. All republics, except Russia, are shown with their respective traditional clothes. Poster of the unity of the Soviet republics in the late 1940s. Note that the map also points out the Karelo-Finnish SSR capital, Petrozavodsk. 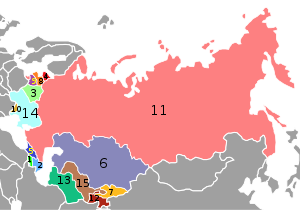 The number of the union republics of the USSR varied from 4 to 16. In majority of years and at the later decades of its existence, the Soviet Union consisted of 15 Soviet Socialist Republics. Rather than listing the republics in alphabetical order, the republics were listed in constitutional order, which, particularly by the last decades of the Soviet Union, did not correspond to order either by population or economic power. The Lithuanian–Byelorussian Soviet Socialist Republic was proclaimed in 1919 but fell very soon. The Far Eastern Republic existed in 1920-1922 as a formally independent state, was de facto under Soviet control. The Persian Socialist Soviet Republic, in what is now Iran. The Turkestan Soviet Federative Republic was proclaimed in 1918 but did not survive to the founding of the USSR, becoming the short-lived Turkestan Autonomous Soviet Socialist Republic of the RSFSR. The Crimean Soviet Socialist Republic (Soviet Socialist Republic of Taurida) was also proclaimed in 1918, but did not became a union republic and was made into an autonomous republic of the RSFSR, although the Crimean Tatars had a relative majority until the 1930s or 1940s according to censuses. When the Tuvan People's Republic joined the Soviet Union in 1944, it did not become a union republic, and was instead established as an autonomous republic of the RSFSR. The leader of the People's Republic of Bulgaria, Todor Zhivkov, suggested in the early 1960s that the country should become a union republic, but the offer was rejected. During the Soviet–Afghan War, the Soviet Union proposed to annex Northern Afghanistan as its 16th union republic in what was to become the Afghan Soviet Socialist Republic. Several of the Union Republics themselves, most notably Russia, were further subdivided into Autonomous Soviet Socialist Republics (ASSRs). Though administratively part of their respective Union Republics, ASSRs were also established based on ethnic/cultural lines. 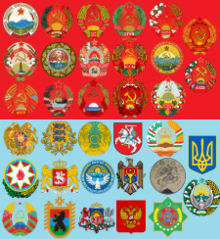 Country emblems of the Union republics, before and after the dissolution of the Soviet Union. Note that the Transcaucasian Soviet Federative Socialist Republic (fifth in the second row) no longer exists as a political entity of any kind, and the emblem is unofficial. Under Mikhail Gorbachev, openness and restructuring were intended to liberalise and open up the Soviet Union. However, they had a number of effects which caused the power of the republics to increase. First, political liberalization allowed the governments within the republics to gain legitimacy by invoking democracy, nationalism, or a combination of both. In addition, liberalization led to fractures within the Communist Party which resulted in reduced ability to govern the Union effectively. The rise of nationalist and right-wing movements, notably led in Russia by Boris Yeltsin, in the previously homogeneously Communist political system led to the crumbling of the Union's foundations. With the central role of the Communist Party removed from the constitution, the Communist Party lost its control over the political system and was banned from operating after an attempted coup d'état. Throughout the unravelling of the restructuring, the Soviet government attempted to find a new structure which would reflect the increased power of the republics. Some autonomous republics, like Tatarstan, Checheno-Ingushetia, Abkhazia, South Ossetia, Crimea, Transnistria, Gagauzia sought the union statute in New Union Treaty. Efforts to found a Union of Sovereign States proved unsuccessful and the republics began to secede from the Union. By 6 September 1991, the Soviet Union's State Council recognized the independence of Estonia, Latvia and Lithuania bringing the number of union republics down to 12. On 8 December 1991, the remaining leaders of the republics signed the Belavezha Accords which agreed that the USSR would be dissolved and replaced with a Commonwealth of Independent States. On 25 December, President Gorbachev announced his resignation and turned all executive powers over to Yeltsin. The next day the Council of Republics voted to dissolve the Union. Since then, the republics have been governed independently with some adopting significantly more liberal policies while others, particularly in Central Asia, have retained leadership personnel from the Soviet time to this day. ^ Hough, Jerry F (1997). Democratization and revolution in the USSR, 1985-1991. Brookings Institution Press. ISBN 0-8157-3749-1. ^ Federalism and the Dictatorship of Power in Russia By Mikhail Stoliarov. Taylor & Francis. 2014. p. 56. ISBN 0-415-30153-X. Retrieved 2014-02-18. ^ "Walter Duranty Explains Changes In Soviet Constitution,". Miami News. News.google.com. 1944-02-06. Retrieved 2014-02-18. ^ "League of Nations Timeline - Chronology 1944". Indiana.edu. Retrieved 2014-02-18. ^ "United Nations - Founding Members". Un.org. Retrieved 2014-02-18. ^ a b "The Occupation of Latvia at Ministry of Foreign Affairs of the Republic of Latvia". Am.gov. ^ "Estonia says Soviet occupation justifies it staying away from Moscow celebrations". Pravda.Ru. 3 May 2005. Archived from the original on 29 September 2007. ^ a b "UNITED NATIONS Human Rights Council Report". Ap.ohchr.org. Retrieved 2014-02-18. ^ a b "U.S.-Baltic Relations: Celebrating 85 Years of Friendship" (PDF). U.S. Department of State. 14 June 2007. Retrieved 29 July 2009. ^ European parliament: Resolution on the situation in Estonia, Latvia and Lithuania (No C 42/78) (1983). Official Journal of the European Communities. European Parliament. ^ Aust, Anthony (2005). Handbook of International Law. Cambridge University Press. ISBN 978-0-521-53034-7. ^ Ziemele, Ineta (2005). State Continuity and Nationality: The Baltic States and Russia. Martinus Nijhoff Publishers. ISBN 90-04-14295-9. ^ Elster, Jon (1996). The roundtable talks and the breakdown of communism. University of Chicago Press. p. 179. ISBN 0-226-20628-9. ^ Held, Joseph (1994). Dictionary of East European history since 1945. Greenwood Press. p. 84. ISBN 0-313-26519-4. ^ Gökay, Bülent (2001). Eastern Europe since 1970. Longman. p. 19. ISBN 0-582-32858-6. ^ Soviets may be poised to annex the Afghan North - Chicago Tribune. August 19, 1984. Retrieved on December 10, 2016. "Miraki said then-Soviet leader Leonid Brezhnev urged Afghan President Babrak Karmal to win Afghan Communist Party approval for Moscow's annexation of eight northern provinces and their formation into the 16th Soviet republic, the Socialist Republic of Afghanistan. The defector said Brezhnev envisioned the southern half of the country as a powerless, Pa-than-speaking buffer with U.S.-backed Pakistan."